Is Every Insurance Agent Like a Snowflake? So, then, it could be true. Every fully developed insurance agent can be different like a snowflake. I’m pondering this analogy because it’s clear that the number one most difficult thing for most agents to do when creating a website (or writing a marketing strategy, for that matter) is to figure out what makes them unique. This is important because they need to differentiate themselves from their competitors, so they can build a compelling case for why people should do business with them instead of their competitors. Still, there are many fully developed agents in the U.S. today — probably the majority of the more than quarter million agents — who don’t know why they’re unique. Obviously the humble snowflake has an advantage in this regard; it doesn’t need to know it’s unique. But it doesn’t have a website or need a marketing plan either. I maintain, however, that like a fully developed snowflake, every fully developed insurance agent is unique. And the sooner such an agent figures out how unique he or she is, the sooner he or she will start becoming even more unique. Demographics. This is the easiest way to differentiate yourself. Specialize in a particular industry group, like restaurants, architects or wineries. If you sell individual and personal insurance products, specialize in young families, young professionals or senior care. Find a group with insurance needs and become the expert. Can you specialize in several industries or demographic groups? Sure, just create a different positioning strategy and website landing page for each group. Geography. If you work in a small town or rural area, there may not be a large enough population for you to specialize in one or even two or three target markets. You have to be generalist. Fine, your specialty is knowing the needs of your community, being active in it and understanding its unique subtleties. On the other hand, if your business is in a large metropolitan area, you can become the 94044 (Pacifica, California) specialist in auto insurance. Product knowledge or specialization. Maybe you’ve acquired deep product knowledge and sales skills in a particular area of insurance, such as business interruption or long-term disability. You are the expert and you write articles, blog posts and give speeches and presentations on the subject all the time. This doesn’t mean you don’t sell other types of insurance, too. Your specialty knowledge is the magnet that pulls clients and prospects toward you. By the way, this comment goes for any of these ways to be unique. Personality. Is there something special about you, something unique about your interests or personality? Do you wear a kilt? Do you always play Santa at Christmas? Were you formerly a high school football coach who took your team to the state championships several times? Are you an avid golfer, skier, mountain climber, whatever, who’s got stories to tell and knows everybody that’s anybody in your vocation? Well, I could go on, but you get the point. Build your professional brand around your personal brand. If you still haven’t figured out what kind of snowflake you are, I’ve got one more idea for you. Have your customers audit you. This can be quite a valuable experience for several reasons. I’ll show you next time. Even when they pay lip service to the concept of being a trusted insurance advisor, most of the insurance agency websites we see are nothing more than online corporate brochures or storefronts for quote engines. There’s nothing wrong with either of these approaches, if that’s what you really want. Maybe you’re just trying to build your agency’s image and save on printing expensive brochures. Or maybe you want to minimize policyholder servicing costs and capture a quick commission. If you really intend to be a conduit for one-off sales from direct writers and that’s your business plan, hats off to you. How does it help—or hinder—in building relationships with prospects and clients? 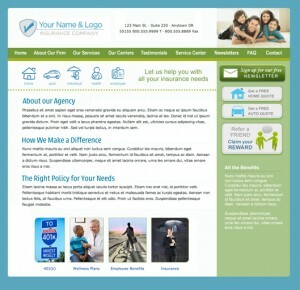 Am I providing the content and services that support the image of a trusted insurance advisor? If you have a website and you sincerely want to be a resource to your clients and have them depend on you for insurance advice as they would an attorney for legal advice, chances are good that your website is underperforming. Don’t do a good job of positioning the agency’s unique value proposition. Don’t make visitors feel like they want to get to know the people who work at the agency. Don’t invite visitors to do business with them or even get to know them. Nice design, lousy performance. Sometimes the problem is there’s too much focus on design. A lot of insurance agencies miss the forest for the trees with this approach. They focus so intently on creating a sophisticated design with high-end gadgets and special effects that they miss the whole point. They think the main reason to have a website is to buff their corporate veneer and validate their credibility. As I said before, if this is your intention, fine. But let me suggest that you’re probably wasting the best marketing tool in your Internet tool kit. The purpose of a website — and even agents with websites that focus on one-off product sales will agree — is to build relationships with people so you can eventually sell them products. Poor design, lousy performance. Sometimes a website is poorly designed and can’t accomplish much of anything. DIY websites are cheap, but the problem is they show it. They lack structure and, as a result, text pours down the page without visual relief; sidebars are loaded with copy that distracts from the main theme of the page; and random graphic devices either scare people off the page or leave them bewildered. But whether an insurance agency website is well designed or not from a purely aesthetic standpoint is almost irrelevant when you consider all their other problems if they’re supposed to be customer-oriented — rather than corporate status symbols or merely window dressing for quote engines. Here’s a list of the ten biggest problems with most insurance agency websites. In my upcoming posts I’ll discuss each of them. Your website builder doesn’t know insurance agents, doesn’t understand your business plan and aside from posting the graphic on your website doesn’t know what a trusted insurance advisor is. If you’d like your insurance agency website to avoid these pitfalls, you should consider using SmartsPro Marketing to build your insurance agency website. You can read about our websites here.